There’s a lot to love about mentorship programs: they empower employees, build relationships, and support learning and development — all using resources you already have. But a Small Giants approach to mentorship goes beyond pairing employees off and hoping for the best. 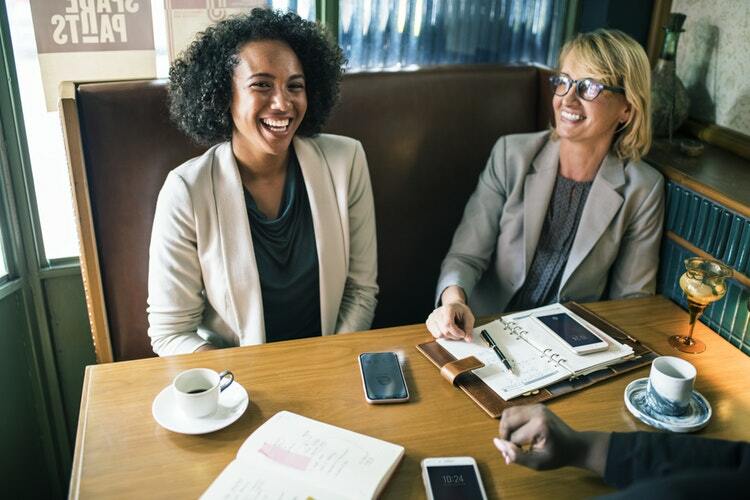 Meaningful mentorship programs are a tool for building individualized development plans for employees, empowering them to gain the skills they need to reach new heights. What does a successful mentorship program look like? M2 Strategy, a technology and management consulting firm, has designed a comprehensive Mentorship, Advancement, and Performance (MAP) program that embeds mentorship into its company culture. Not only does the program give employees a clear path for growth, it also ensures that employee happiness is always at the heart of the company. Mentorship is a powerful tool for employee training and development. Using M2 Strategy’s MAP program as our framework, here are the steps you should know to get started. Instead of leaving mentorship pairings to Leadership, empower employees to choose mentors that are the right fit for them. M2 Strategy built a bank of available mentors that employees can use to find someone with the skills or experience they’re looking for. When mentorship is employee-motivated, the partnership is more likely to stick. Give your employees input on what they’re learning and who they’re learning from. When M2 Strategy first started their mentorship program, they pre-assigned employees to four mandatory mentorship meetings every year. But as Chief Operating Officer Helo Mustafa remembers, “The meetings often felt forced. We determined it wasn’t as effective, so we changed it to employees proactively reaching out to mentors on their own.” Now, employees can reach out to any mentor within the company and set up meetings to learn about new skills, discuss career goals, or to just sit down and chat. Successful mentorship needs purpose and intent. S.M.A.R.T goals (goals that are specific, measurable, achievable, results-focused, and time-bound) provide structure for mentor relationships and create a framework to measure success. That’s why M2 Strategy’s mentorship program is just one piece of a larger performance program — the MAP program allows them to grow employees, track their progress, and constantly give and receive feedback. Goal setting is a great way to create accountability. Every quarter, all M2 employees have a performance review with a mentor or manager to discuss their goals and how they will achieve them. They use TrakStar to log their S.M.A.R.T. goals, including at least one personal goal, and align them with the company’s overarching strategic goals. The meetings help clarify and manage expectations and identify the steps they’ll need to take to achieve their goals. The meetings serve as quarterly checkpoints to make sure everyone is on track and moving in the right direction. Goal-setting is as much about the ‘what’ as it is the ‘why.’ It all starts with your organization’s core purpose and values. It’s important that everyone in the organization is aligned on what’s important and why their work matters. Employees should be able to tie their goals and decisions back to your core values: how do their goals help support the company’s purpose? How do each of their goals demonstrate their commitment to core values? M2 Strategy uses a Culture Book to align employees from the very beginning. 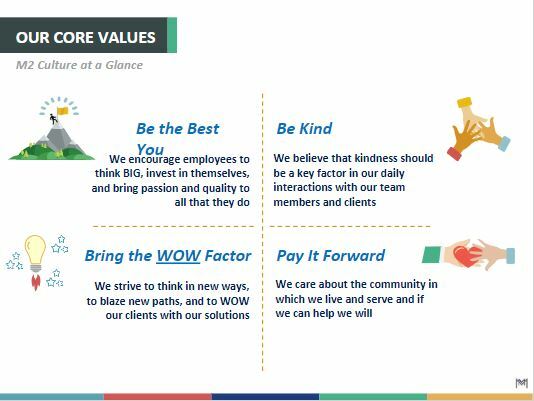 When a new employee comes on board, their Culture Book provides a comprehensive welcome that explains and defines company core values, key cultural initiatives, and awards and accomplishments. Core values are also used in MAP meetings to help mentors and managers get to know employees better. For example, why does your project manager want to improve their public speaking skills? Encouraging employees to explain what motivates them will help you understand their goals on a deeper level and provide more meaningful support. The success of your mentorship program depends on the readiness of your mentors. Invest time into training your mentors on how to effectively motivate and teach others. At M2 Strategy, all mentors are trained on the MAP program, which includes how to facilitate performance reviews. The training teaches mentors about leadership and how to inspire and mentor others. A mentor is not just someone who possesses certain skills — they need to be an effective, committed leader. One way to keep tabs on your mentorship program is through your managers. At M2 Strategy, bi-weekly manager meetings are an opportunity to check in on how their mentorships are going. Because M2 Strategy tracks the MAP program on Trakstar, they can easily find out how often mentorship meetings are happening and which goals have been achieved. At manager meetings, they ask managers specific questions about employee progress and identify opportunities for additional support. In many Small Giants companies, annual performance reviews are a thing of the past. In a culture of performance, there are more effective systems in place to track and support employee performance. For example, M2 Strategy got rid of the traditional “ranking” system at yearly evaluations. Instead, they hold quarterly performance reviews facilitated by a manager or mentor who is aligned with their personal goals and current responsibilities. During the review, they discuss their past performance and their goals and aspirations. The meetings cover everything from career growth to personal goals to showcasing work products. Both the employee and the facilitator always come to the table with new ideas for innovation and growth. The MAP program creates a system of accountability that supports employee performance year round. Through mentorship, goal setting, and performance reviews, employees are always striving for innovation and personal growth. Looking for more ways to help your employees grow and develop? Download the Small Giants Approach to Training & Development and learn how! 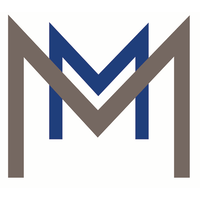 M2 Strategy is an award-winning technology and management consulting firm whose solutions have been instrumental in promoting innovation in industries such as Science, Education, Health, and Defense. Founded in 2003, M2 Strategy is a Women-Owned Small Business that has received frequent accolades and client appreciation due to the transformational change provided to clients. We have been honored to collaborate with numerous organizations to successfully implement forward-thinking solutions that address complex challenges and streamline processes to gain efficiencies. M2 Strategy has been recognized by multiple major publications as a Best Place to Work, including Inc. Magazine and the Washington Business Journal.